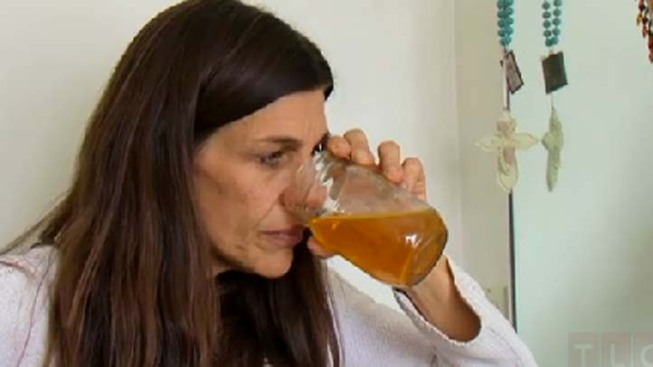 A woman with an obsession with her own urine appears on "My Strange Addiction." TLC’s “My Strange Addiction” will spotlight on its season finale Sunday a woman who drinks, bathes, brushes her teeth and washes her eyes in her own urine. Carrie, 53, believes that her urine obsession will help in her cancer fight, according to MSNBC. "I like warm pee. It's comforting," she says in TLC's sneak peek of the episode that's heavy on close-ups of her drinking her favorite beverage. Carrie says she has become a connoisseur of sorts since she first gulped her own urine four years ago and didn’t vomit. The clip shows her daughter Cassie saying that she fears the obsession isn’t good for Carrie's health. The family’s story airs in full Sunday at 10 p.m.
Other obsessions from Season 3 have included a man who claimed to be in an intimate relationship with his 1998 Chevy Monte Carlo, a woman addicted to snorting baby powder, a nail polish drinker, an adhesive tape eater, and a woman obsessed with having super-sized breasts.